That means it must be pretty good. You don't like GW lately and their profits have doubled in the last year. I'm not big on modern GW's bombast, but I like it. It definitely showcases the "this ain't your daddy's pewter" aspect. I just hope it's not a hundred ing dollars. Their "this scale" of character models are ridiculously priced. And don't anybody give me that tired "fewer models in a command pack" line. That's just an excuse; one that would hold water if we weren't talking GW, who would always sell enough units to offset such costs, regardless. While I like the nighthaunt figures, I'm not excited about this one. And the picture of her on the GW front page looks like a character from a Tim Burton animation. yeah not really feeling that. I quite liked the weird mer-elfs or what ever they where that came out recently. Andy has nailed this new undead army for me when he mentioned Tim Burton the whole army seems to be a rather over the top selection of comical bed sheet ghosts. Huh, I had the exact opposite reaction. I really like these guys but am not fond of the sea elves. I guess that is why they make different armies.
" I really like these guys but am not fond of the sea elves. " I really like the characters and beasts, but don't think much of the grunt troops. I'd have been happier if they were more "typified" sea elves. Some of the out-of-the-box aspects of these guys missed the mark, IMO. I LOVE this new Nighthaunt range!! It's aesthetic is creepy and disturbing with a balance of classic spooky. I think it was a brilliant design choice to have her face veiled. Often what you don't or can't see is scarier than what you can see. I also love that GW was bold with making all of the models floating by having thin bits attached to the bases. All the naysayers criticizing this because of the potential for the models to break, well I have some advice. Maybe devise a better way to protect your models during transport. I've been taking models with fragile bits to gaming stores across town for years and in ten + years I don't think I had one instance of a model actually breaking, not even thinly attached models like Nighthaunt. I've dropped models during games that chipped and broke at a thin point, but that's not the fault of the model. You drop any model and something has a chance of breaking on it. For this kind of range, I wouldn't even attempt to use any kind of foam inserts. Too expensive to devise and too difficult to lay properly in a foam tray. I just take left-over cardboard boxes that are tall enough and I would take a model like the Mortarch of Grief and put her in the box STANDING UP. Then, just take gift-wrapping tissue and carefully stuff it all around the outside of the model until the model is suspended in the center. Then just tape the box shut. I've used this approach with models like the Skaven Screaming Bell and the Empire General on Gryphon. I've transported those models in boxes standing up while suspended in tissue and they have been taken on dozens of car trips without a single bit of damage. I've done this with models for years, and have actually at times dropped the box by accident, as in the box tumbled to the floor and bounced around. And the model inside was totally fine! I agree with PS about the sea elves. Just didn't do it for me. I tried very hard to get excited about that range but in the end couldn't. But as PS correctly observes, that's why they make different armies to choose from! I like the Sea Elves, but this reminds me of a Disney flick. A lot of the models for their "new" factions seem to be re-releases of the old Warhammer stuff. Because it is still Warhammer and a lot, if not all, of the old stuff moves forward with the fluff. They need to release it with the round bases though. I feel like the new undead really capture a flow and movement better and don't seem so static to me. I think this model painted differently would really have made a stronger impact. I'm not a fan of the white scheme. I think this is the best of the Night Haunts (Wraiths) group, as she has the most body and least flat, sharp, clothing. I like the two secondary undead things but not the overall thing. 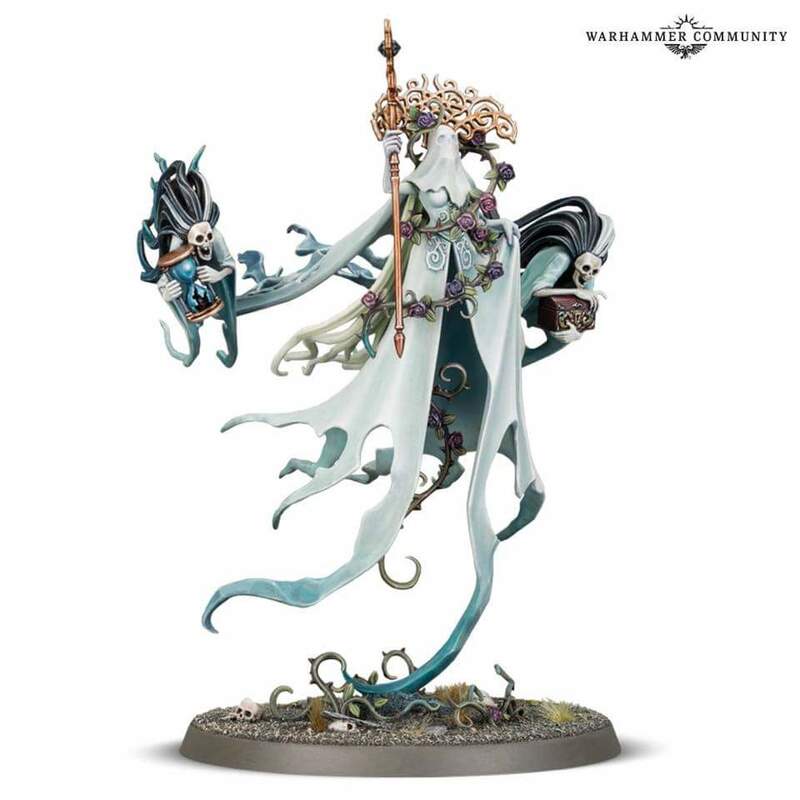 I like the nighthaunts in general but im not crazy about this one. Its pretty cool, but it doesn't make me want to run out and buy it. About the new models being attached by small bits… I use and transport these on a weekly basis and they are stronger than you would think, if you use plastic glue and not super glue. I've had more problems with pewter miniatures coming apart on me. I had MANY more issues in transporting ANY of my Privateer Press pewter miniatures, which would fall apart at the drop of a hat. I started using 2 part epoxy to try to keep them in one piece! I did have a GW spirit host break its thin tail, but that was my fault for just throwing it in a box with a bunch of miniatures. It was really a pain to fix… so try to avoid that! You are 100% right about plastic glue! If you wargame and have to transport minis. plastic cement should always be the glue of choice! Super glue is obviously a necessity for metal minis. but as you said you can use epoxy for strong bonds as well. There's no way in h**l I would ever buy any of the Nighthaunt range and think about using super glue on them. Way too delicate with way too fragile joins. You plastic cement these things and you're increasing their durability by 10x. My rule of thumb is any time I'm assembling plastic miniatures it's plastic cement. For metal, resin, etc. is when I explore all the best super glue and epoxy choice. Yeah I avoid metal miniatures like the plague and go for plastic whenever possible and use plastic model glue to assemble them. I do know some maniacs who use superglue on plastic models and that's why I qualified with "if you use plastic glue and not super glue". kalgaloth, I wonder if I'd like this one better without the white, too. I do like the other nighthaunt models better. but this reminds me of a Disney flick. Remember they are focusing on Warhammer Adventures. But there are quite a few things that this a lousy miniature. It only needs a little modification and a different paint job, but I'll hold my final judgement until I see a firm price. It isn't cool enough to be as expensive as the existing Mortarchs (plus looks quite impractical as a gaming mini). The price is $45. USD Not bad for such a large and intricate figure. Certainly less than the $100 USD speculated above.